Football season here in the UK is getting ready to kick off, and part of our ritual on this beautiful island is creating a football dream team that will fight it out each week earning us points. One of the better Dream Team competitions out there is The Suns, especially as they offer cash prizes every week to the top performing teams. You can now follow your Dream Team on your android phone with the newly released (and free) app from the Sun. 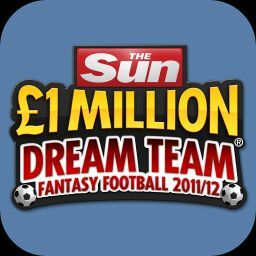 Get your FREE team into The Sun's Â£1m Dream Team football game with this app! Our brand new Sun Dream Team App will let you to enter a free team into the Â£1million Fantasy Football competition from the palm of your hand! The 2011/12 seasonâ€™s App will let you pick a team, make pre-season and in-season transfers and join or create mini leagues to compete against friends. There will also be 100 cash prizes up for grabs each week with our free to play Weekend Dream Team game! Keep up with all the latest game stats throughout the season to help guide you with your big decisions as well as all the latest news from Dream Team HQ with game stories, player ratings and Twitter updates from @dreamteamfc. This App is FREE to download. Look out for subsequent free updates as we release more features that youâ€™ve asked for!